Pigbag have confirmed more gigs to follow on from their Newcastle gig this weekend. First up, they’ll be playing at the Half Moon in Putney, London on Friday 25th January 2013. Also they will be playing at the Hare & Hounds in Kings Heath, Birmingham on Saturday 16th February 2013. Tickets are available here. The band line-up has also changed over the past couple of years. 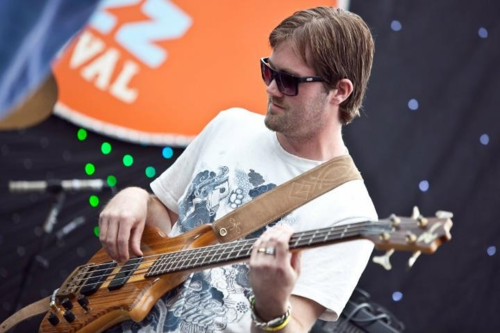 Sven Atterton (pictured above) is the bass player and has been with the band since the Mostly Jazz festival in July 2011, John Sam (drums) has played at the Bristol and Amsterdam gigs. On the forthcoming album, Max O’Donnell (guitar) and Karme Caruso (keys) join the band and also played the recent gig in Newcastle. Also at the Newcastle gig, Oliver Nelkin stood in for Annie Whitehead on trombone.